Across Canada, the cenotaph is a central component of the central square of villages, towns, and cities. Erected in the wake of the First World War, these cenotaphs faithfully record those who gave their lives in the first global conflict. The First World War was the ‘war to end all wars.’ While not nearly as massive or bloody as the Second World War, it is the First World War that is remembered as The Great War. These cenotaphs recording the war dead are deeply embedded on the landscape. And, unlike so many memorials, they are not invisible. Growing up, I was always aware of them and what they meant. They were solemn and dignified, almost always identical, obelisk shapes. I remember reading the names of the dead on them, and not just on Remembrance Day. The dead of the First World War seemed so faraway from me, growing up in the 1980s, beyond living memory for me. My grandparents served in the Second World War. And whilst my grandfather’s service as a tailgunner in the Royal Canadian Air Force held a certain romance, it was nothing compared to the First World War. And so the First World War maintained this mystique. Even if the veterans handing out the poppies in return for a donation to the Royal Canadian Legion were from the Second World War when I was younger, it was a symbol of the First World War they pinned to my lapel. Last month, I was in Ottawa and visited the National War Memorial located at the intersection of Elgin and Wellington streets, kitty corner to Parliament. The Monument, somewhat ironically, was dedicated in May 1939 to honour the war dead of Canada. Ironic, of course, because the Second World War broke out in Europe barely three-and-a-half months later. It was whilst staring at this monument that something really struck me about our cenotaphs and war memorials: they tend to date from the First World War. In this case the artillery is that of the First World War, down to the cavalry on horses. These monuments may include the names of Canadian soldiers who served in conflagrations before that one, of course, such as the Boer War. But it is the First World War dead who appear in great number. And the war dead of later wars, including the Second World War were added to the original monument. They were not the original soldiers, and whilst their sacrifices are the obvious equivalent, these memorials date not from their war(s), but the Great War. And so these original soldiers, those who fought and died in the First World War were the baseline for the Canadian military and, even if this wasn’t the first time that war was made real for Canadians, it was the first time it was made real on a national scale. And even if the First World War left a complicated legacy on Canada, it remains that it was perhaps the first great crisis the country faced. And it gave rise to a series of stories, some true, some mythical, about the import of the war on the still young Dominion at the time. ‘Everyone is a literalist when it comes to photographs,’ Susan Sontag wrote in Regarding the Pain of Others. She has a point, sort of. We expect photographs to represent reality back to us. But they don’t, of course, or they don’t necessarily. For example, she discusses an exhibit of photographs of September 11, 2001, that opened in Manhattan in late September of that year, Here is New York. The exhibit was a wall of photographs showing the atrocity of that day. The organizers received thousands of submissions, and at least one photo from each was included. Visitors could chose and purchase a laser printed version of a photo, but only then did they learn whether it was a photo from a professional or an amateur hanging out their window as the atrocity occurred. Sontag talks about the fact that none of these photos required captions, the visitors will have known exactly what they depicted. But she also notes that one day, the photos will require captions. Because the cultural knowledge of that morning will disappear. 9/11 is already a historical event for today’s young adults. So we return to the veracity of photos, our expectation of a documentary image of the past. For me, the first time I was seriously arrested by a photograph was in my Grade 12 history textbook, in the section on the Second World War. There was a photograph of an American soldier lying dead on a beach somewhere in the Pacific. I don’t remember where or which battle. I don’t remember the image all that well, actually, I don’t think the viewer could see the soldier’s face. I remember just a crumpled body, in black and white. And for the first time, I understood the devastating power of war and the fragility of the human body. Later, in grad school, I read Ian McKay’s The Quest of the Folk, about how Nova Scotia’s Scottish history was carefully constructed and curated by folklorists at the turn of the 20th century. At the start of the book is a photograph of a family next to their cottage on a hard scrabble stretch of land on the Cape Breton coast. McKay plays around with captions of the photo, both the official one in the Nova Scotia archives in Halifax, and alternative ones. I realized that photographs are not really necessarily a true and authentic vision of the past. And so, in reading Sontag’s words I opened this essay with, I thought of the fact that we do like to think of ourselves as literalists when it comes to photography, we expect a ‘picture to say a thousand words,’ and so on. Just prior to this comment, Sontag discussed Francisco Goya’s Disasters of War, a series of plates that weren’t published until several decades after Goya’s death. The disasters were the Napoléonic invasion of the Iberian Peninsula in 1808. These plates are vicious. And Goya narrates each, claiming each one is worse than the other, and so on. He also claims that this is the truth, he saw it. Of course, they aren’t the documentary truth, they instead represent the kinds of events that happened. That does not, however, lessen their power and brutality. But they are also not photographs. This photograph is staged. Gardner and his assistants dragged the body of this dead Confederate soldier from where he fell to this more photogenic locale. They also staged his body. And yet, given our insistence on literalism in photography, the viewing public took this photo for what it’s worth and accepted it as a literal representation of the Battle of Gettysburg. It was over 100 years later, in 1975, when a historian, Willian Frassantino, realized that all was not as it seems. Of course, what Gardner, et al. did in staging the photos of the Civil War seems abhorrent to us, unethical, even. But it was not so in the mid-19th century at the literal birth of this new medium of representation. Nonetheless, what is the lesson from Gardner’s photograph? Do we dismiss it for its staginess? Do we thus conclude that the photos of the Civil War are fake? Of course not. Gardner’s photos, like Goya’s Disasters of War, are representations of what happened. They are signifiers that things like this happened (I am paraphrasing Sontag here). It does not make these representations any less valuable. Young men did die by the thousands in the Civil War. They died at places like Gettysburg, and they died like the staged body of this unfortunate soul. The horrors of war remain intact in our minds. We have a representation of what happened, and this one in particular (like Goya’s Disasters) has been replicated countless times since 1863, we have seen countless other images like this, including for me, the one in my Grade 12 history textbook when I was all of 17 years of age. The image is still real. Today marks the 75th anniversary of the massacre at Zmievskaya Balka, a ravine in Rostov-on-Don, Russia. The literal meaning of Zmievskaya Balka is ‘ravine of snakes.’ It was here on 11-12 August 1942 that the Jewish men of Rostov were marched out to the ravine, just outside the city, and shot. The women, children, and the aged of the Jewish population were gassed, and their bodies dumped at Zmievskaya Balka. Communists and some Red Army soldiers met the same fate, along with their family. All told, 27,000 people were massacred. At least 20,000 of them were Jewish. This massacre is one of the forgotten ones of World War II and the Nazis. My guess is no one reading this post will have ever heard of it. Soviet and Russian authorities have done their best to make sure the massacre, or at least the Jewish fact of it, is forgotten due to the on-going anti-Semitism of the state. In 2004, activists managed to get a memorial plaque erected that identified one of the massacre sites and noted the Jewishness of the victims. In 2011, approaching the 70th anniversary of the massacre, this plaque was removed. It was replaced with a more banal commemoration of the “peaceful citizens of Rostov-On-Don and Soviet Prisoners of War.” This erases the primary act of the Nazis in Rostov 75 years ago: the eradication of the city’s Jewish population. And, it obscures the Nazis murderous anti-Semitism. One thing I have learned teaching history, of all varieties (World, Western Civ, American, Irish) is that human beings have long held a fascination with killing each other. Human beings have developed all kinds of methodologies and technologies dedicated to making murder easier and faster, from crucifixion, to Dr. Guillotine’s invention, to machine guns, tanks, bombers, etc. I may be a cynic, but I believe that a world without war is impossible, based on history. I’m reading Njal’s Saga, a Norse saga set in Iceland, amongst the Vikings, in the late 10th century. The violence just goes around in cycles, as a feud develops between two good friends, Njal and Gunnar. And yet, today is Remembrance Day (or Veteran’s Day in the United States). On 11 November, every year, I think of several things. First, I think of Erich Maria Remarque’s novel, All Quiet on the Western Front, and the sad, lonely death of Paul Bäumer, killed on the morning of 11 November 1918, amongst the last casualties of the Great War. I think of the Treaty of Versailles, and all the damage caused by France’s very understandable desire to punish Germany. I think of how the Germans were complicit in Hitler’s rise to power. I think of the Japanese imperial mandate and the horrors of its empire, and I think of the butchery of both World Wars. The Somme. The trenches. Dresden. The Blitz. Hiroshima. Nagasaki. When I was a kid in school back home in Canada, and I had to memorise this poem every November; it depressed me. It made me want to cry (I probably did cry a couple of times when I was really young). McCrae wrote this poem on 3 May 1915 after he presided over the funeral of his friend, Alexis Helmer, after the Second Battle of Ypres. McCrae himself met his end in the First World War, on 28 January 1918, of pneumonia, at the No. 3 Canadian General Hospital at Boulogne. I also think of my own grandparents, Rodney Rupert Browne (1925-98) and Eleanor Shipman Browne (1918-2003). Rod and Eleanor, who didn’t yet know each other, served in the Royal Canadian Air Force. I don’t know when Eleanor joined, but I know that Rod enlisted when he was 17 in 1943, just before his 18th birthday. He served as a tail gunner. He never talked about what he saw or what he did during the war. And I knew better than to ask him. Same with Eleanor. Whilst she was obviously based in England, I know she saw horrors, of injured men, of German bombing blitzes. Rod came back to Montreal and married another woman, who bore him three children (two of whom, including my mother Carole Anne, and her brother, Russell, survived), and Eleanor went back to Ontario and married another man. Both ended up divorced, and they met in the 1960s and married. They remained together until Rod died of cancer on Christmas Day, 1998. Eleanor, who was a feisty old gal, held on until 2003, when she died that summer. Rod is the reason I became an historian. One day in 1992, he met me in Montreal (I lived in Ottawa; he and Eleanor had retired to Gananoque, Ontario), and for some reason, he took me on a tour of his Montreal, showing me my family’s past, he inculcated in me that day a sense of my own history, my own past. And he and Eleanor nurtured it in me until the end of their lives. And they loved me and supported me unconditionally. But the Second World War profoundly marked them. They both came home scarred by what they had seen. They both wandered in the wilderness for a couple of decades after 1945. So, for them, I wore poppies every year in Canada, something I can no longer do in the United States. But, it is them I will be thinking of today (though I still miss them both every day), and all their comrades-in-arms, all those who did not come back (including the wars since 1945), those who came home troubled, damaged, and who have had to struggle to regain an equilibrium. Marc Bloch is one of the most influential historians ever. An historian of mostly medieval France, he, along with Lucien Febvre, founded the Annales school of historiography in the late 1920s. The Annalistes preferred examining history over the long durée, and across various periods of time. They also advocated a more complete history than one of generals, presidents, prime ministers, and other so-called Great Men. Bloch met his end at the hands of the Gestapo on in Saint-Didier-des-Champs, in France, on 16 June 1944, ten days after D-Day, as the Nazis realised they were going to lose France. Bloch had been a member of the Résistance since 1942. He was captured by the Vichy police in March of that year and handed over to the Gestapo. He was interrogated by Klaus Barbie, and tortured. It was a sad end for a great man. Bloch had served in the French Army during the First World War, and remained a member of the Army reserve in the interregnum between the two wars. He was called up into action during the Second World War and was on hand for the baffling collapse of France in the face of the Nazi blitzkrieg attack in May 1940. That summer, he wrote his blistering and searing account of the Fall of France, Strange Defeat, not knowing if his words would ever see the light of day. The book was published in 1948, four years after his murder, and three years after the war ended. Bloch is unflinching in his critique of French High Command, and France in general, for the collapse of its Army in 1940. In part, he blames the High Command’s over reliance on a false reading of history, that led it into a state of pathetic stasis, incapable of recognising that 1939-40 was not 1918, and that the Second World War was a different war than the Great War. In this passage, he makes a passionate argument for what the study of History is. History is, in its essentials, the science of change. It knows and it teaches that is impossible to find two events that are ever exactly alike, because the conditions from which they spring are never identical…the lesson it teaches is not that what happened yesterday will necessarily happen to-morrow, or that the past will go on reproducing itself. By examining how and why yesterday differed from the day before, it can reach conclusions which will enable it to foresee how to-morrow will differ from yesterday. The traces left by past events never move in a straight line, but in a curve that can be extended into the future. I assigned this book for my historiography class, and was deeply struck by this passage. I’ve re-read it four times now, it goes against what our culture thinks history is. Our culture thinks history is exactly what Bloch says it isn’t, that it can teach us to avoid the same mistakes over and over again. I was thinking about this in light of my Irish history class dealing with The Liberator, Daniel O’Connell last week. O’Connell led the movement for Catholic Emancipation in Ireland, succeeding in 1829. He the turned his sights on the Repeal of the Act of Union (1800), which created the United Kingdom of Great Britain and Ireland. In this, he failed. He failed because times had changed, and attitudes were different. In the early 19th century, many in Britain, and even some amongst the Protestant Ascendancy in Ireland, had come to the conclusion that the denial of civil rights for Catholics in Ireland was not a good thing, and that Emancipation was necessary. Three of the staunchest opponents of Emancipation came around to O’Connell’s way of thinking: Sir Robert Peel, the Home Secretary; The Duke of Wellington, the Prime Minister, and King George IV). In the 1840s, though, when O’Connell’s Repeal movement reached its apogee, he did not have a groundswell of support in Britain (or amongst the Protestant Ascendancy) for Repeal. Thus, he failed because O’Connell failed to learn the proper lessons of History. We would do well to remember Bloch’s maxim. Even we historians. 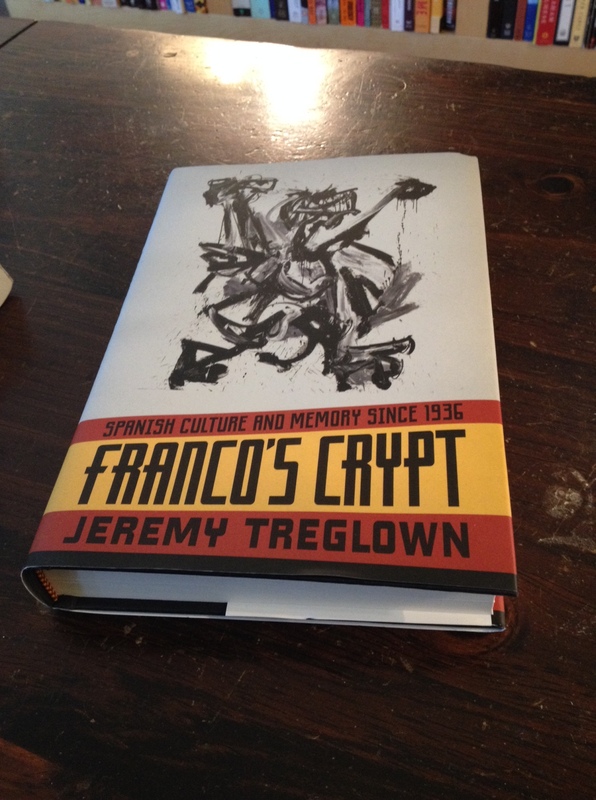 I have just finished reading Jeremy Treglown’s fantastic Franco’s Crypt: Spanish Culture and Memory since 1936. Treglown is a literary critic, so he approaches history and memory in a manner rather different than a historian, nonetheless, there is definite overlap in methodologies. I must say, I was originally concerned when I picked up the book and read this on the dust jacket: “True or False: Memory is not the same thing as History.” Um, yeah, true. No kidding. But, the whims of publishers are rather different than the arguments of authors. Treglown does a fantastic job of dealing with the complexities of the Spanish Civil War of 1936-9 and then the long Francoist dictatorship from 1939 until the Generalisimo’s death in 1975 and the transition to democracy that followed. Treglown works very hard against the myth that Republicans = Good and Nationalists = bad during the Civil War. He also works hard against the myth that Franco’s régime was purely repressive and oppressive vis-à-vis art and artists, noting that a great amount of art (film, literature, music, visual art, sculpture) emerged in Francoist Spain. This is not to say that Treglown paints a rosy picture of Francoist Spain. He doesn’t. He doesn’t glorify Franco, but he seeks to complicate the dictator and the community of artists in Spain during and since the Civil War. He also deals with the complexity of characters like Camilo José Cela. Cela was a nationalist soldier during the Civil War, and later worked as the censor for the Francoist state. And yet, he was also himself a novelist, and remarkably blunt and sensitive in his work. He began a literary journal in 1956 “as a way of countering cultural officialdom and giving space to the ideas of Spanish writers living abroad.” A noble sentiment, given that most of those expat Spanish writers were expatriates due to the Civil War and Franco’s dictatorship. Above all, San Camilo, 1936 grieves for Spain, gazing at a graveyard full of flowers of all colors, ignoring the shouts of “¡Viva la república!” and “¡Viva España!” because “it is no use being too enthusiastic when melancholy nests in the heart. But what mostly interests me about Treglown’s discussion about San Camilo, 1936 is the intersection between memory and forgetting. As Cela writes, “No one knows whether it is better to remember or to forget. Memory is sad and forgetting on the other hand usually repairs and heals.” Nevertheless, as Treglown notes, San Camilo, 1936, is essentially a “puzzled, angry act of commemoration.” In other words, Cela and his characters remain ambivalent with what is to be done with trauma, history and memory. I find Cela’ claims about the virtues of forgetting to be interesting. We live in an era that seems to believe the opposite in many ways. In our times, cultural historical memories have been exhumed and examined in public. Sometimes this takes the form of commemoration, (such as in Cork, Ireland, in the summer of 1997, marking the 150th anniversary of the Famine) or commissions of Truth and Reconciliation (such as in South Africa after Apartheid). Treglown himself recounts attempts by the caretakers of Franco’s memory to maintain his dignity, three decades later at the Valle de los Caidos (Valley of the Fallen), a huge monument outside of Madrid to honour the Nationalist fallen of the Civil War. Meanwhile, since the end of the dictatorship in 1975, the Spanish have attempted to exhume the bodies of massacred Republican soldiers and sympathisers. Indeed, the balance of power has tipped in favour of the Republicans, to the point where the atrocities committed by them during the Civil War have been whitewashed, just as the Francoists whitewashed the Nationalist atrocities. 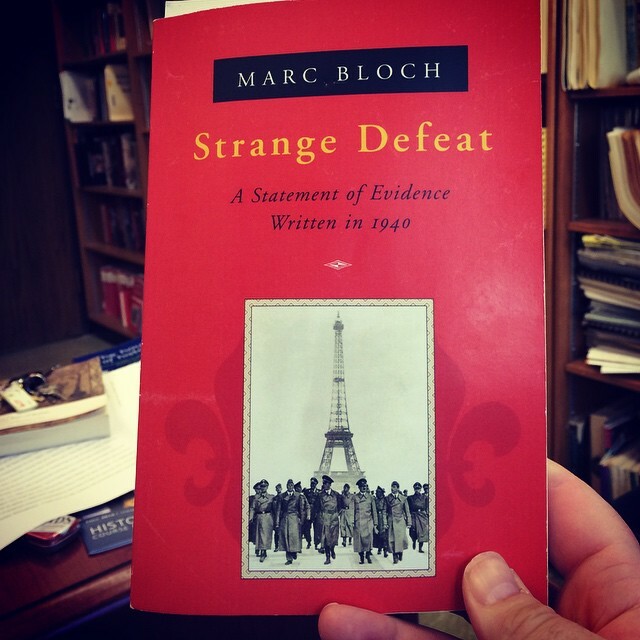 Cela’s words, however, led me to think about Marc Bloch’s blistering Strange Defeat: A Statement of Evidence Written in 1940, about the quick Fall of France at the start of the Second World War. Bloch, a captain in the French Army and the country’s most famous historian, wrote this on the run from the Nazis (who eventually killed him). Strange Defeat is a searing book, almost painful to read, written by a fierce French patriot stunned and shocked his nation collapsed in defeat at the hands of the Nazis. Bloch blames France’s political and military leaders for failing to have prepared for modern warfare. And while Bloch remains an annaliste (the school of historical scholarship Bloch pioneered) in writing Strange Defeat, the immediacy of the events he’s describing and his anger and fury are clear. Bloch was too close to the events, and too involved, to provide a long-view analysis of the Fall of France (nor, for that matter, did he wish to). The same can be said of Cela, a Nobel laureate. San Camilo, 1936 was published in 1969, thirty years after the end of the Civil War, while Franco was still alive and in power. Cela, like Bloch, was involved in the events his novel attempts (or doesn’t attempt) to deal with, and his view on the past, memory, and forgetting is perhaps not surprising. My grandfather, Rodney Browne, was 17 when he joined the Royal Canadian Air Force in 1943. He was a tail gunner, which meant his chances of survival were pretty slim. And yet he did survive, and he came home to Montréal in 1945 with the conclusion of the war. But he was traumatised, deeply. He suffered silently, primarily by drinking. And he was restless, unable to settle into a job or family life, until his late 40s/early 50s, nearly thirty years after the war. By the time I was born, Rod was settled, married again, and he was a good grandfather. It is from him that I gained an historical consciousness about the Irish in Montréal. He didn’t talk about his past much, and he never talked about the war. I later found out that this was pretty common for men of his generation who served in the Second World War. He didn’t want to remember, which is why he drank when he got home, trying to obliterate those memories. So maybe, it is the generation who lives through the worst of the trauma that wishes to forget, to never have to think of the atrocities they saw or committed. It is their descendants who feel the need to excavate these memories. Either way, these are not complete thoughts on memory, commemorations, and forgetting. Memory and forgetting remain incredibly powerful tools in historical scholarship. You are currently browsing entries tagged with second world war at Matthew Barlow.